Ben formerly served as Chief of Police for the City of Frontenac. His first exposure to working police dogs came during his time at the Police Academy, when he had the chance to observe K9 officers from St. Louis Police training. In 1987 he attended the St Louis Police K9 School himself and certified his first police dog. 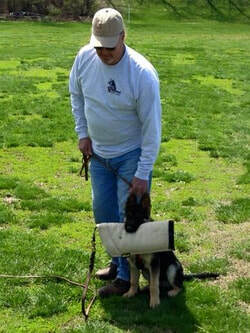 The City of Frontenac purchased a police dog from trainer Bob Frisby in 2001. This was Charly Ipel, a bi-color German Shepherd imported from Czechoslovakia, and the beginning of Ben's fascination with the dogs and their training. One of Charly's pups, Velka Cerna Branch, was retained for breeding and is now a companion to Rob Wideman, one of Ben's partners in Lone Wolff K9. Ben lost Charly in 2015 and now has a new stud, a dark sable Czech import named Dyson Benax, a certified Police K9. Dyson is DM clear and OFA certified. Ben is a past member of the National Police Canine Association, and has been a member of North American Police Work Dog Association since 2001. Rob was a Missouri Conservation Agent from 1972 to 2004. A fellow agent, Bob Frisby, was Rob's first introduction to K9 training and schutzhund-trained German Shepherds. Bob has been a qualified trainer since the mid 1980's, as well as an owner and handler. In 2000, Rob obtained a female German Shepherd named Hannah von Lindenhof, a bi-color of Czech descent. Rob and Hannah were working toward her BH when she was tragically kicked by a horse, breaking her hip and leg and requiring extensive surgery. Despite the veterinarian's diagnosis to the contrary, Hannah made a full recovery, although she never returned to training. Rob, however, never lost his interest, and in 2012, shortly after losing Hannah, he and Ben became co-owners of Velka Cerna Branch, a black female from Ben's GSD import, Charly Ipel. Velkey was instrumental in Rob's decision to get more involved with schutzhund dogs, including obtaining Captain Milo von Wolfram, another bi-color GSD with whom he recently obtained his BH. Velkey, meanwhile, has raised four litters with Ben's stud Dyson, two of which are now with police departments in Boston and Oshkosh, Wisconsin.